Explanation: If you took a picture of the Sun at the same time each day, would it remain in the same position? The answer is no, and the shape traced out by the Sun over the course of a year is called an analemma. The Sun's apparent shift is caused by the Earth's motion around the Sun when combined with the tilt of the Earth's rotation axis. The Sun will appear at its highest point of the analemma during summer and at its lowest during winter. Analemmas created from different Earth latitudes would appear at least slightly different, as well as analemmas created at a different time each day. 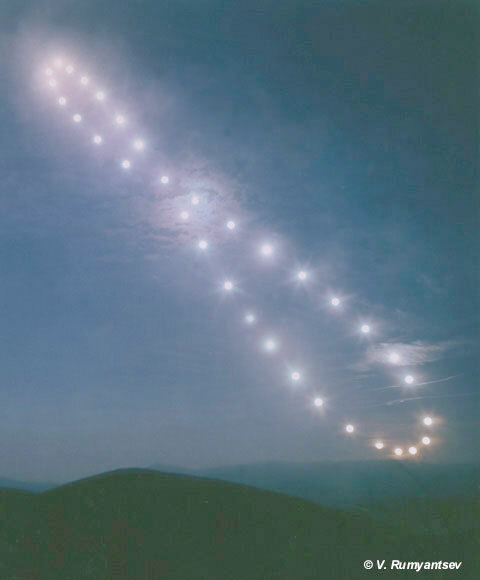 The analemma pictured to the left was built up by Sun photographs taken from 1998 August through 1999 August from Ukraine. The foreground picture from the same location was taken during the early evening in 1999 July.